It's another Happy Monday! I'm really looking forward to this week as I will be sharing Holiday Mini Sneak Peeks every day this week. What fun! Today's Sneak Peek project was designed for the Pals Paper Arts Challenge. The Pals Paper Arts challenge this week is a theme, Dress for Success. "Dressing for Success is easy as 1-2-3 this week at Pals Paper Arts. Follow our simple recipe to success: Use 1 piece of designer series paper, 1 punch and 1 sentiment. 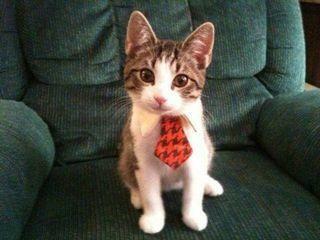 Like our feline friend, your card will be best-dressed!!" Isn't this the cutest kitty ever that the Pals gave us for inspiration? I don't think my Oreo was ever that tiny! 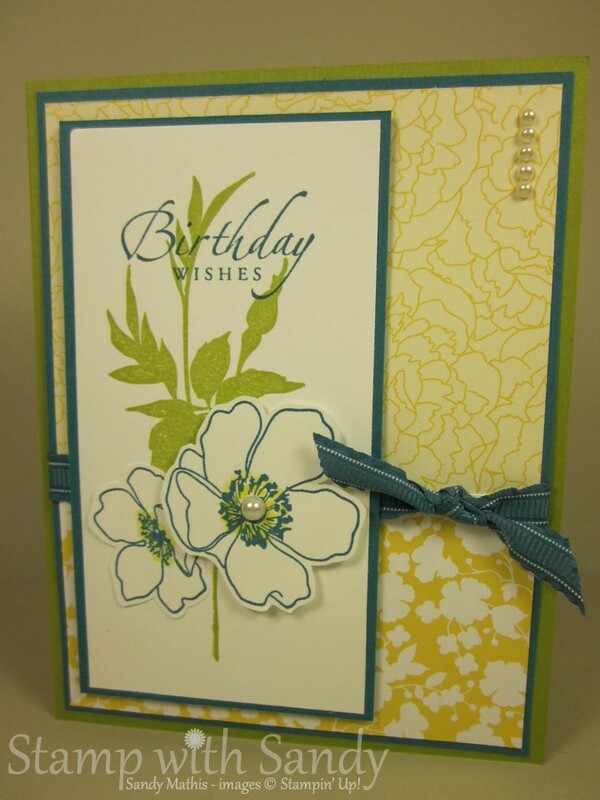 This card features three products from the about to be released Holiday Mini Catalog.The new Spice Cake Designer Series Paper is just fabulous and features the colors Pool Party, More Mustard, Very Vanilla, Soft Suede, River Rock and Pear Pizzazz. The Gently Falling Stamp Set is a two-step set, my favorite kind! First you stamp the background color and then the outline right over it. Velvet Stitched Ribbon in Very Vanilla (yum!) is the perfect embellishment. May I celebrate with you a bit? My entry to the PPA challenge last week, above, was a Pals Paper Arts Artist Pick Winner! There is nothing more satisfying than being acknowledged by your peers. Thanks, PPA Design Team, you made my day! To see the original post for this card, click here. If you are not already on my mailing list and would like to receive a copy of the Stampin' Up! Holiday Mini Catalog, click here to request a copy. Ready to got shopping right now? Click here. Be sure to stop by tomorrow for another Sneak Peek! 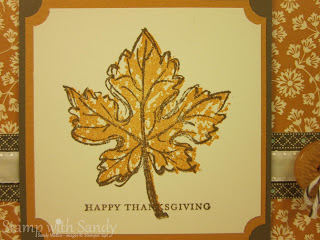 Great fall theme card! I just love fall, so I'm always attracted to anything with a fall theme, especially leaves. Congratulations on being a Pals challenge winner this week. Another beautiful card this week Sandy! Love that leaf! Thanks for joining in the fun at Pals Paper Arts! Oh, I love this card! The perfect stamp set and colors to welcome fall! Can you tell I'm tired of summer? ?